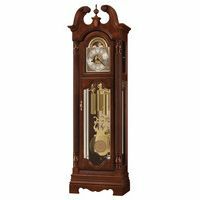 Classic english style grandfather clock with nested bell chimes with 9 bells: Case in Case in mahogany with crotch mahogany veneer and maple inlays, 2 doors, beveled crystal glass, handpainted, original Black Forest dial with fine rose ornaments. 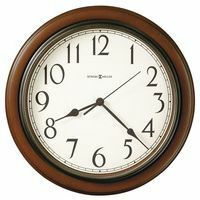 KSU 55 movement with quarter-chiming cable movement, and triple chimes (Westminster, St. Michael and Whittington) on nested bells, run time 7 days. 6 bronze bushings (2nd wheels), removable cable drums, pallet anchor with stationary escapement (Graham) and automatic beat adjustment, cable winding stops, maintaining power, true second, separate chime shut-off for hour and melody with weight drop and automatic night time shut-off between 10.00 PM and 7.15 AM, integrated dial lock lever. 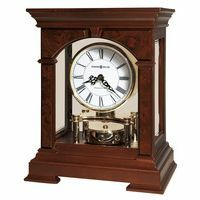 Each clock is made in limited quantities and numbered.